Home / POLITICS / Ondo State Governor, Rotimi Akeredolu (SAN) will soon announce his first set of appointments. Ondo State Governor, Rotimi Akeredolu (SAN) will soon announce his first set of appointments. Akeredolu, who was sworn in on Friday, February 24, 2017, is expected to do so after his current trip to Abuja. On Thursday, Akeredolu attended a meeting of the All Progressives Congress (APC) which had in attendance members of the National Working Commitee (NWC) and Governors on the platform of the party. At the meeting presided over by APC National Chairman, John Odigie-Oyegun, Akeredolu was formally introduced to other governors. A source told our correspondent that the governor was taking his time to ensure round pegs in round holes for smooth running of his administration. 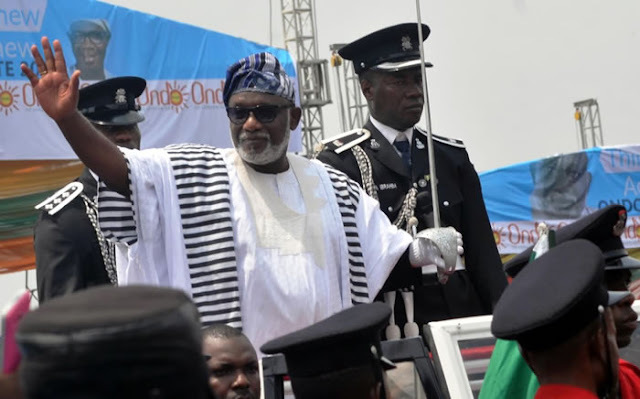 Many had expected that Akeredolu would have, in less than a week, announced occupants of at least three positions – Secretary to the State Government, Chief of Staff and Chief Press Secretary. While the names are being expected, some individuals have emerged as top contenders. Prior to Akeredolu’s inauguration, speculations suggested he had settled for a former member of the House of Representatives from Akure, Hon Ifedayo Abegunde (Abena) for the position of SSG. Abena’s name emerged after choice of the current deputy governor, Agboola Ajayi as running mate to Akeredolu. Also on the cards are Barrister Ade Oluwajana, Engr. Tunji Light Ariyomo and Niyi Adegbomire, SAN. Many among the public however expect the position of SSG to naturally go to Akure-born Ariyomo because of his acumen, leadership experience and organizational skills. For the position of Chief of Staff, there are two people from within the camp of the defunct Action Congress of Nigeria (ACN). They are Hon Solagbade Amodeni, former Chairman of Akoko South East Local Government and ex-Commissioner under ex-governor, Olusegun‎ Mimiko. Also in contention is the APC Deputy State Chairman, Hon. Ade Adetimehin. Adetimehin, it was learnt, stood behind Akeredolu during the governorship primary and may be rewarded with the position. Others on the list are former banker, Timehin Adelegbe, and a retired permanent secretary, Gbenga Ale. Our correspondent gathered that if these persons do not clinch the job, they may get commissioner’s slots. But in the case of Adetimehin, he may be elevated to the positiom of Ondo State APC Chairman if the incumbent Isaac Kekemeke steps down. The position of the main information manager to the Governor, the Chief Press Secretary, may go to Yemi Olowolabi. He has been the head of Akeredolu’s media team for a long time and many expect him to assume the position. However, he may be appointed Commisoner for Information if someone else is appointed the CPS.